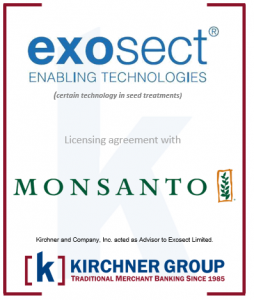 July 18th, 2018 – Kirchner Group is pleased to announce that it acted as advisor to Exosect Limited in connection with a licensing agreement with Monsanto Company related to the use of certain Exosect technology in seed treatments. A copy of the Exosect announcement can be viewed here. Exosect is a lean formulations company that exploits the characteristics of their unique, proprietary technology platforms. They apply their extensive formulations know-how to enable the efficient, targeted delivery of biological and synthetic active ingredients. The technology platforms deliver a unique mix of commercial and environmental benefits. Additional details on the transaction were not disclosed. Throughout the decades Kirchner Group has been internationally recognized for its unique business model centered around creating value while promoting values – “earning while returning”. The firm has also established a reputation for building and rebuilding important business and social paradigms based on its deep entrepreneurial orientation. Kirchner Group expands in Canada with two senior hires. M&A Banker and BDC Banker join firm.